Nutrition labels on various food products must comply with numerous, ever-changing requirements. Items such as meat and poultry products, food packages, and dietary supplements are subject to stringent federal regulations-and the costs of compliance are often significant. The Nutritional Labeling and Education Act of 1990 (NLEA) imposed new mandates for labeling of many packaged food products; still others became subject to a voluntary nutrition labeling program. Following that lead, USDA has imposed parallel labeling requirements. 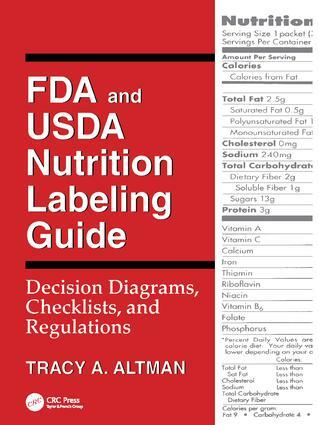 FDA and USDA Nutrition Labeling Guide: Decision Diagrams, Checklists, and Regulations provides hands-on information and guidelines for understanding the latest federal nutrition labeling requirements. This plain English analysis of FDA and FSIS labeling rules contains diagrams and tables and cites specific regulations. Decision diagrams walk the reader through volumes of information and make sense out of complicated regulatory processes. Checklists for managing information for developing specific labels help the reader track regulatory changes and document regulation applicability to company products. The RegFinder index references not only the text, but also provides hundreds of regulatory citations, referenced by topic. FDA and USDA Nutrition Labeling Guide: Decision Diagrams, Checklists, and Regulations will be of interest to food industry personnel responsible for compliance with federal nutritional labeling regulations, food product developers and food technologists. Faculty teaching food laws and regulations and food product development will also find this book of interest.